A Member of the European Parliament (MEP) (in English-speaking member-states where national parliamentarians are known as MPs, such as the United Kingdom and Malta), also called a Eurodeputy (in English-speaking member-states where national parliamentarians are known as deputies, as in the Republic of Ireland and Cyprus; and commonly used in English by other non-anglophone member-states) is a person who has been elected to serve as a popular representative in the European Parliament. MEPs are organised into eight different cross-nationality political groups, except the 15 non-attached members known as non-inscrits. The two largest groups are the European People's Party (EPP) and the Socialists & Democrats (S&D). These two groups have dominated the Parliament for much of its life, continuously holding between 50 and 70 percent of the seats together. No single group has ever held a majority in Parliament. As a result of being broad alliances of national parties, European groups parties are very decentralised and hence have more in common with parties in federal states like Germany or the United States than unitary states like the majority of the EU states. 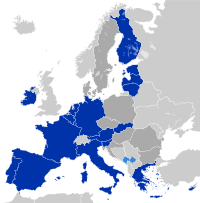 Although, the European groups, between 2004 and 2009, were actually more cohesive than their US counterparts. Every month except August the Parliament meets in Strasbourg for a four-day plenary session, six times a year it meets for two days each in Brussels, where the Parliament's committees, political groups and other organs also mainly meet. The obligation to spend one week a month in Strasbourg was imposed on Parliament by the Member State governments at the Edinburgh summit in 1992. The total cost of the European Parliament is approximately €1.756 billion euros per year according to its 2014 budget, about €2.3 million per member of parliament. As this cost is shared by over 500 million citizens of 28 countries, the cost per taxpayer is considerably smaller than that of national parliaments. Until 2009, MEPs were paid (by their own Member State) exactly the same salary as a member of the lower House of their own national parliament. As a result, there was a wide range of salaries in the European Parliament. In 2002, Italian MEPs earned €130,000, while Spanish MEPs earned less than a quarter of that at €32,000. However, in July 2005, the Council agreed to a single statute for all MEPs, following a proposal by the Parliament. Thus, since the 2009 elections, all MEPs receive a basic yearly salary of 38.5% of a European Court judge's salary – being around €84,000. This represents a pay-cut for MEPs from some member states (e.g. Italy, Germany, and Austria), a rise for others (particularly the low-paid eastern European Members) and status quo for those from the United Kingdom (depending on the euro-pound exchange rate). The much-criticised expenses arrangements were also partially reformed. Members declare their financial interests in order to prevent any conflicts of interest. These declarations are published annually in a register and are available on the Internet. The oldest member is Jean-Marie Le Pen, aged 90, born in 1928, the founder and former member of the National Front. The youngest is Andrey Novakov of GERB in Bulgaria, aged 30, born in 1988, who joined the parliament in 2014. ^ "Rule 1 in Rules of Procedure of the European Parliament". Europarl.europa.eu. 20 September 1976. Retrieved 2011-11-28. ^ Kreppel, Amie (2006). "Understanding the European Parliament from a Federalist Perspective: The Legislatures of the USA and EU Compared" (PDF). Center for European Studies, University of Florida. Retrieved 26 September 2008. ^ Indeed, Brussels is de facto the main base of the Parliament, as well as of the Commission and the Council. European Parliament in brief. Retrieved 20 May 2010. ^ "The budget of the European Parliament". European Parliament web site. Retrieved 26 Jul 2015. ^ Lungescu, Oana; Matzko, Laszlo (26 January 2004). "Germany blocks MEP pay rises". BBC News. Retrieved 5 January 2010. ^ Fresh start with new Members' Statute: The salary – a judgmental question. European Parliament Press Release. 7 January 2009. ^ "EP adopts a single statute for MEPs". ^ "EU Parliament Users' Guide Code of Conduct for Members" (PDF). European Parliament. Archived from the original (PDF) on 3 June 2017. Retrieved 6 March 2017. ^ In addition, Australian and other Commonwealth citizens residing in the United Kingdom are eligible to vote and stand for election there. This page was last edited on 12 April 2019, at 12:36 (UTC).